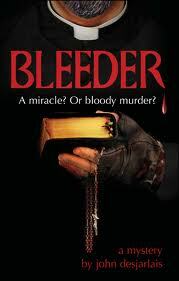 I've been doing well with my lenten reading, and I just finished a Catholic fiction entry entitled Bleeder, published by Sophia Institute Press under their Imagio Catholic Fiction line. It's a murder mystery, and it was quite good. And frankly, any Catholic fiction whatsoever is hard to find, so I'm thrilled to point books out when I do find them, particularly when they come from an orthodox Catholic press. Our protagonist is Reed Stubblefield, a college professor recently the victim of violence which has left him traumatized and disabled, who heads to his brother's remote cabin in northern Illinois for some relaxation and writing to soothe his soul. He's not a Catholic, but quickly becomes aware of a priest in the area who has attracted quite a bit of attention due to claims of his alleged healing powers and possession of the stigmata - the wounds of Christ. Reed's brother is a new Catholic convert and friend of the priest in question, Father Ray. His brother conspires to initiate a friendship between Reed and the priest, believing that it will prove emotionally and spiritually beneficial. We follow Reed as he struggles through meeting new people in the tiny town and getting to know Father Ray - is he genuine, or perpetuating a giant hoax? We encounter journalists, both kindly and unscrupulous, and a rabid group of followers of Father Ray. Some are vehement in their devotion of him, while others present themselves as following an old Gnostic heresy and use him for their own purposes. Suddenly... (and this isn't a spoiler, it's right in the description of the book on the back cover) Father Ray bleeds to death on Good Friday during Mass. What happened to him? Was this part of his stigmata, or something much more sinister? The police think Reed has something to do with all this. What on earth would the motive of an ailing Presbyterian classics professor be? I very much enjoyed this book. Reed is quite likeable, and there is a host of interesting secondary characters. The storyline is intriguing, and I thought handled in a very realistic and thought provoking manner. I definitely recommend this book. "Just before All Souls' Day someone entered the names of nine parishoners in her church's Book of the Dead, seeking prayers for their souls. The problem? All nine are still alive. Until they start getting murdered...one by one...in the precise order their names were entered in the Book of the Dead...and always right after a local visionary sees a mysterious woman known as the Blue Lady..."
Thanks for the recommendation! I'm going to buy this. If the website link is an affiliate link for you...or, if you have an affiliate link I can buy it through, will you stop by my site and let me know? I'll buy it through you if possible.